Enjoyed the series initially but getting frustrated with the plots, the characters and the repeated gullible story lines. Love this series, and it keeps getting better and better. 4.0 out of 5 starsHoping for more. While I have enjoyed Adele Abbotts Witch PI series, "Witch is when my heart broke " seems to be more a collection of stories. Each section seems to be trying to make enough words to stretch the book out. The stories are good but not as cohesive as usual. The two best parts of the past books, the mystery story and learning to be a witch, seem to have been rushed in this book. It's almost as if Adele Abbott is juggling to many characters. I read at the back of the book that there will be 2 new series this year and another Jill Gooder later as well. I look forward to reading them. As they are set in the same towns, I would assume there will be some cross over. I love this series. Although this book just seemed too short and cut off at the end, I'm glad to see Jill standing up to that goofy cat. If it were me that cat would be on a leash long ago. I mean really, who lets a cat ruin their finances ? I'm also glad to see that her selfish sister has the common sense to tell Jill that her lies are going to come back to bite her, but she's still a selfish control freak. Or that was what it felt like. There was no overlying theme for the book. Worse, several of those short stories went nowhere. This not one of the author’s better novels. Time is meant to stand still in Washbridge when the main character is in Candlefield - yet she keeps getting phone calls from Candlefield while she's in Washbridge and vice versa. Which begets the question, how does time stand still if you're still getting phone calls?! Other than that it's a bit of light fluff and enjoyable, but the story is very slow at unfolding. I love this series of books by Adele Abbott. If you are thinking of reading this, please go back to the beginning and start with book 1. It will make more sense if you do. This is book nine, so there's been lots going on involving character development. 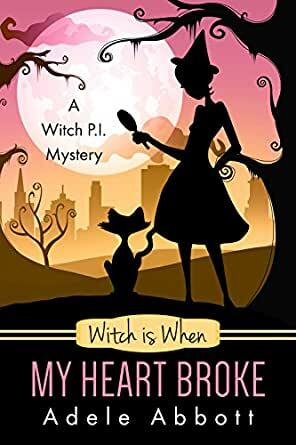 This is a wonderful, fun series if you like light-hearted witchiness!